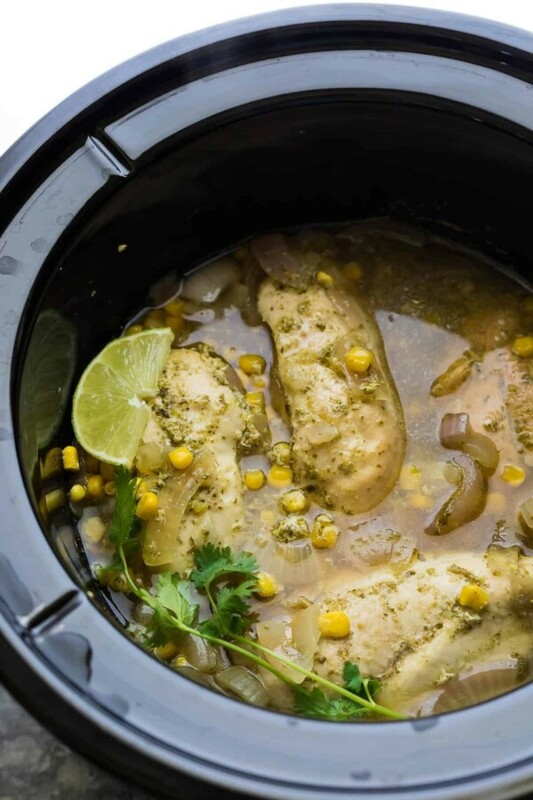 These slow cooker cilantro lime chicken tacos can be assembled ahead and stored in the freezer until you are ready to cook them up. The cilantro lime chicken is versatile and is also great on salad, in wraps, pizza, you name it! Here we are. The end of August! And for the first time in the history of my life, I’m actually looking forward to the fall. I was just so so so hot this summer. 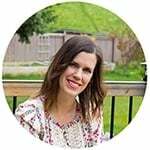 We have had one of the hottest summers I can remember, and I have been overheating for 99.9% of the time (thank you, pregnancy). One night I looked over at Ben in bed. He was wearing: a hoodie with the hood pulled up, a flannel sheet, and a duvet pulled up to his chin. I had a tank top on, and all the blankets kicked off. Yep. Story of my summer. So while I am grateful for the amazing memories we made this summer (and they have been amazing!! ), I am definitely ready for some (slightly) cooler weather. 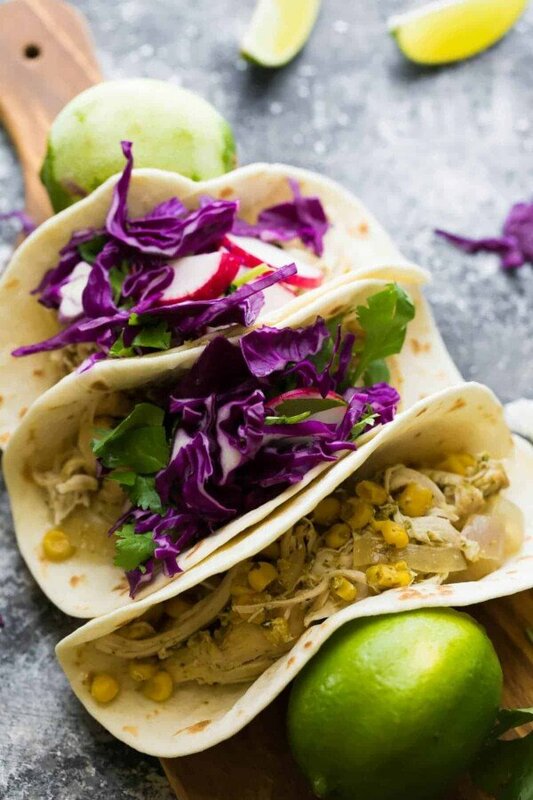 But it’s still August and I’m sticking with summer flavors for the very last possible day…so today I’m sharing these slow cooker cilantro lime chicken tacos with you! The concept: assemble your ingredients ahead of time. Freeze them. 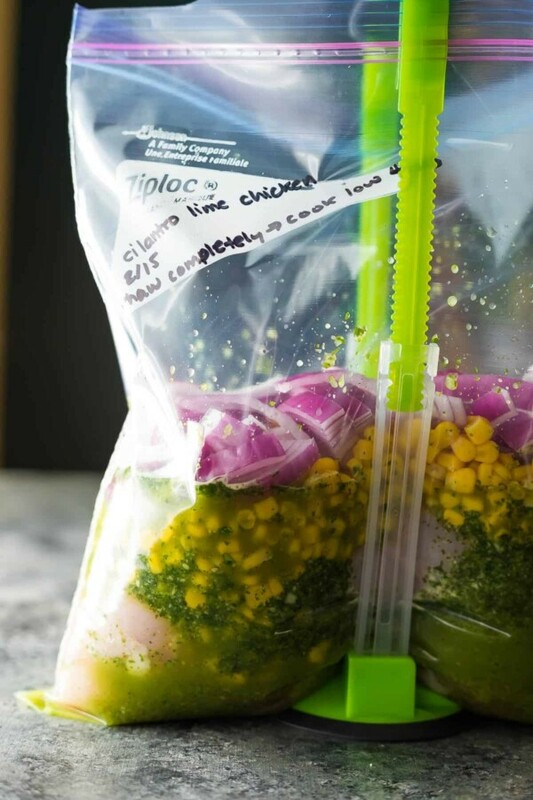 The night before you cook up your meal, thaw them in the fridge. And the day of? Dump them in the slow cooker, push the button, and walk away. It’s so easy! Does assembling these ingredients and putting them in the slow cooker fresh take much effort? No. 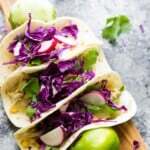 But having the decision made for you, the decision that you are having slow cooker cilantro lime chicken tacos for dinner, is one less thing on your mental plate, and that pretty much makes me want to start jumping for joy. to do this, but you could also use a stand blender. with the chicken, onions and corn, and freeze for up to 3 months. 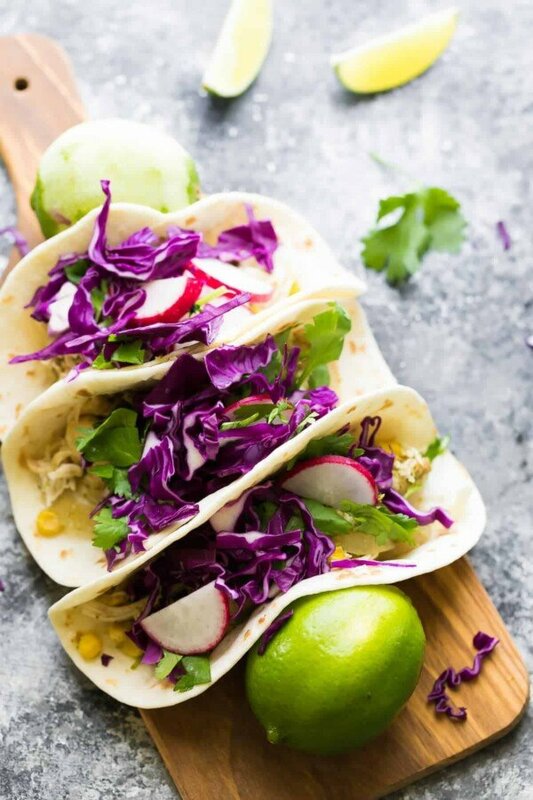 When you’re ready to cook up your slow cooker cilantro lime chicken tacos, you will need to thaw the ingredients first. I know some people throw their frozen ingredients straight in the slow cooker, but this can result in food safety dangers. We don’t want anyone eating improperly cooked chicken, now do we? 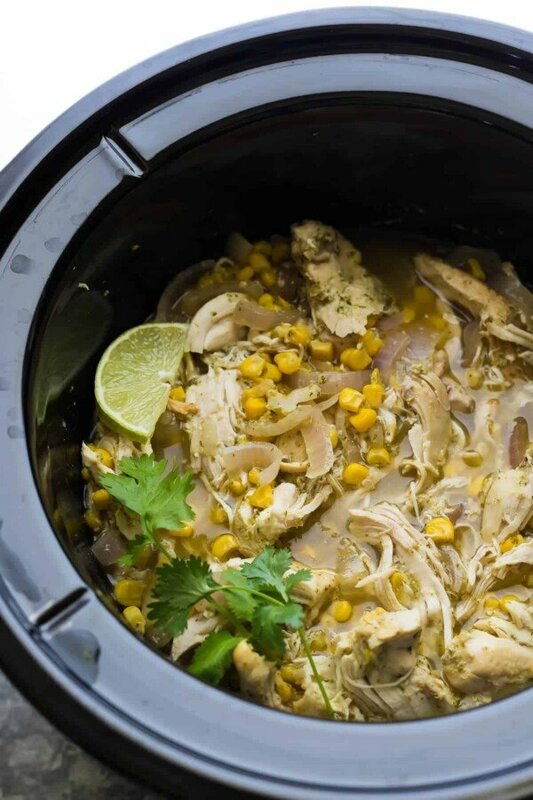 So make sure you thaw your ingredients in the fridge the night before, and toss everything into the slow cooker. You will be rewarded with one major thing off your mental plate and a huge head start on dinner! 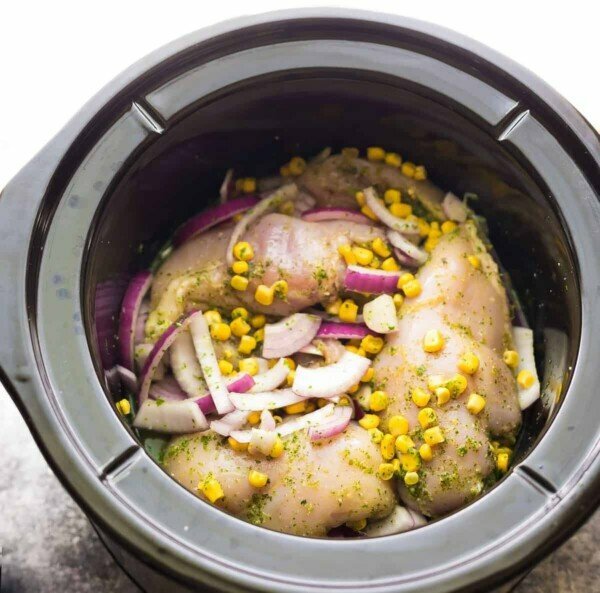 To cook right away:In the base of a 5 quart slow cooker, place the chicken breasts, corn and onion slices. 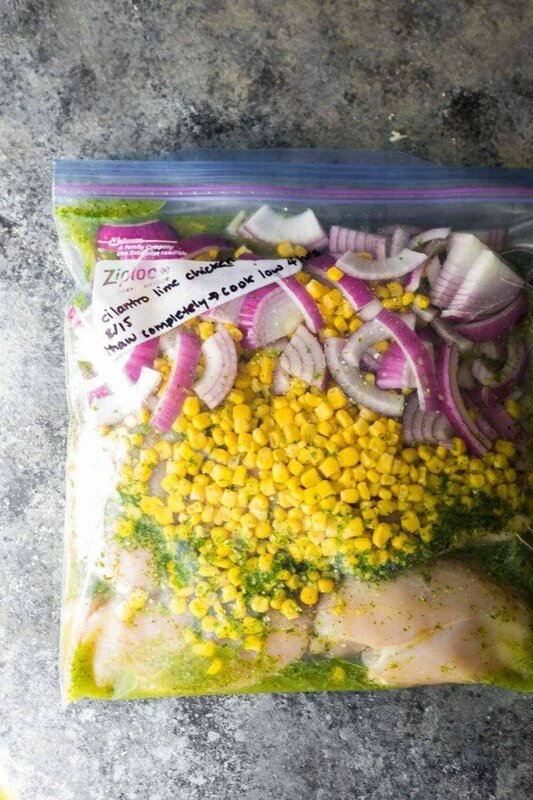 To assemble and freeze:In a gallon sized freezer bag (see note), place the chicken breasts, corn and onion slices. 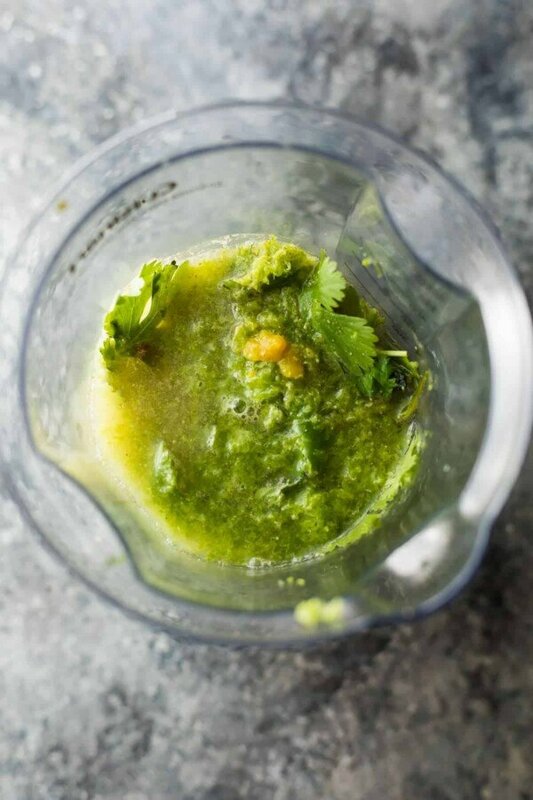 Do you think you could make this in a pressure cooker AKA instapot? if so any idea how long to cook? Also would you blend the liquids and add that with chicken? Hi Jodi! I bet you could, though I haven’t tried. I would try for 8 min with a quick pressure release, and I would blend all the liquids. Hope you enjoy! Hi!Can I put the crockpot on high if I have less time to make it? Hi Vanessa! I think that would be OK, but be careful as chicken breasts can overcook in the slow cooker! I would cook on high for no more than 3 hours in my slow cooker (though mine definitely cooks ‘hot’). It was a little unclear how much chicken breast to use. There is a slider that adjusts the recipe but the chicken always says 28 oz. Is the base recipe for about 28 oz of chicken or was I supposed to use giant chicken breasts each being 28 oz? Hi Steven! Sorry for the confusion, each chicken breast is roughly 7 oz working out to 28 oz. Hope that makes sense! If I am halfing the recipe what should I cook it on in crockpot, thank you! Hi Morgan! If you are halving the recipe I recommend using a smaller slow cooker like a 2.5 quart model. This one *may* be OK halved in a larger slow cooker (5 quart) but it might cook a lot faster due to low liquid in the pot. I would cook it on the lowest setting for 3-5 hours and keep an eye on it so it doesn’t over-reduce and burn. Hope you enjoy! Does the end product tend to be watery / juicy? I don’t mind a little juice but too much ruins the shells. Hi Brandy! This recipe is a bit liquidy, but we scooped the chicken out before stuffing the tacos. If you are interested in a thicker sauce, you could try this one. This was so delicious! I’m going to make this a staple in our home. Everyone absolutely loved it! Even the picky toddlers!! Yay! Picky toddlers are the toughest critics 😀 Thanks so much for taking the time to leave a review, Nichole! I dread bringing meals to neighbors because I never know what to make! Pinning this to make the next time an occasion arises, although I think I may try it for my family too. Thanks Denise! I hope you enjoy it Rachael! Can’t find a Pin button!! Hi Terry, I’m having some technical issues with my social sharing buttons at the moment. The pin it button is the green button above that says ‘b’. I have no idea why it says ‘b’, LOL, but I’m working on getting my share buttons fixed!